Nigel “Flevans” Evans’s eclectic and versatile productions have made him a shining light in the UK for years now. Having established himself with his debut project ‘Make New Friends’ (a collection of EP projects) released in 2004 through Brighton’s Tru Thoughts record label, the DJ/producer/multi-instrumentalist introduced his sample-based and beats-driven project holding its own against releases from label-mates Quantic and Bonobo. Subsequent Flevans projects have masterfully kept fans guessing – with projects ranging from instrumental compositions like ‘Unfabulous’ (Jack To Phone Records, 2007), vocal-based collaborative projects like ’27 Devils’ (Tru Thoughts, 2009) or the alternative-electronica of alter ego AOTOA for Jalapeno Records. ‘A Distant View’, released through LOA Records in 2016, proved a real treat for fans that had waited patiently for new music. Definitely a project that fell into the category of instrumental sample-based dare-I-say masterpiece, the album was propelled by a mix of drum-heavy breakbeat funk and down-tempo gems like ‘Stripped’ and ‘A Distant View’. 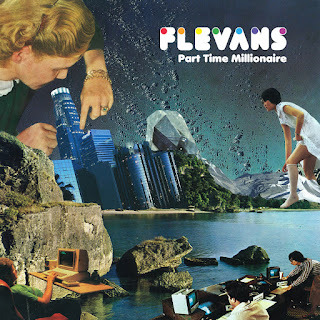 And in a comparatively short time, Flevans returns with ‘Part Time Millionaire’ as an official member of the Jalapeno Records stable. Themselves coming off a great run of projects with last year’s ‘Ruthless Day’ by Gizelle Smith and the new project from Aldo Vanucci ‘Digging For A Living’. In typical Flevans fashion, the follow-up to ‘A Distant View’ may not be at all what people would have expected. Partnering up with a dream team of contemporary funk & soul vocal talent, 'Part Time Millionaire' showcases more strings to the bow and does so effortlessly. Laura Vane, the artist cited as being “the catalyst for this album” – sounding just as good backed by Flevans as she typically does by The Vipertones – guests on several songs including the infectious sing-a-long single ‘Invisible’ and the brilliant reworking of Lauryn Hill’s ‘Ex Factor’, Elliott Cole beautifully brings to life two Flevans-penned tracks ’15,000 Words’ and ‘Two Steps’, long-time collaborator Sarah Scott breathes life into ‘It Just Goes’ and Jalapeno label-mate Izo FitzRoy guests on the organ-driven ‘Some Day’. ‘Part Time Millionaire’ serves as another win for Jalapeno amongst their slew of recent album releases solidifying their name as one of the finest funk & soul labels the UK can lay claim to. Flevans has always had a unique ability to keep his projects as unpredictable as his long list of talents and abilities would allow him to be, and while fans rejoice in this thrilling release, the obvious question now is... what's he going to do next?